Visiting the Cherry Blossoms in Washington D.C.
Cherry Blossom Season in Washington D.C. is arguably the most beautiful time of year in the Nation’s Capital. The season attracts visitors from all over the world to come and see the spectacular site of thousands of blooming cherry trees. This year, the cherry trees reached peak bloom on April 5, which means 70% of the blooms were open. Our family visited the Tidal Basin and the cherry trees on April 8, three days post peak bloom. The trees still looked magnificent even though evidence of “blossom snow” on the ground was apparent due to the recent high winds. In ideal conditions, the blooms can last a week or more after peak bloom. It was hard for me to imagine the cherry trees being any fuller than the day we saw them. The most famous, and the one seen in all the iconic photos, is the Tidal Basin. It looks like a lake, has thousands of cherry trees lining its waterline, and also has several monuments surrounding it. The Jefferson Memorial is one of the magnificent monuments around the Tidal Basin. The day we visited was a glorious day with blue skies. 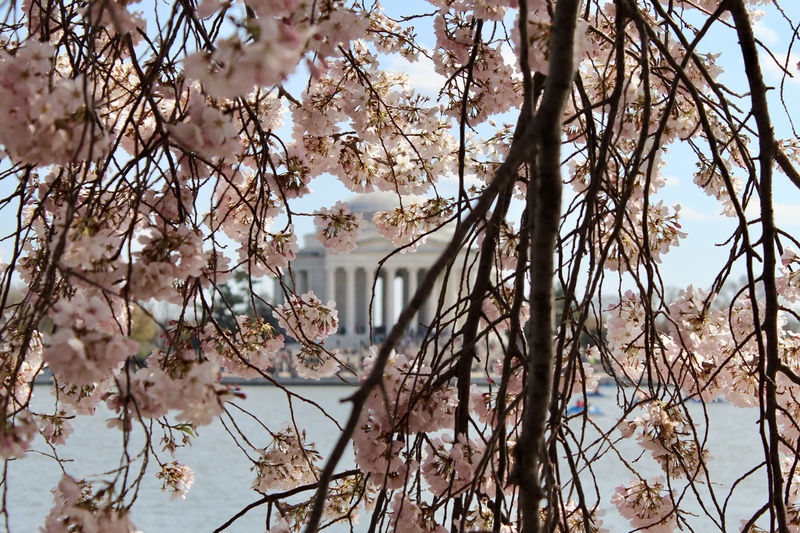 The majority of the cherry Blossoms are located around the Tidal Basin but you can also view them from the steps of the Jefferson Memorial, Martin Luther King Jr. Memorial, Tidal Basin Paddle Boats, and the Japanese Lantern. By far, the easiest way to get to the Tidal Basin is by Metro, the closest stop being the Smithsonian. If you are traveling by car, there is metered parking in the area, but it will be tough to find a spot. My advice is to find parking farther away like at Haines Point and walk to the Tidal Basin. We took the metro to the Smithsonian stop and walked to the Tidal Basin. Driving anywhere near the Tidal Basin during Cherry Blossom season is a nightmare. If at all possible, I recommend going during on a weekday. The weekends are very crowded, and it can be difficult to navigate your way around the Tidal Basin on foot. If you’re getting a ride – there are two good drop-off points. One is next to the MLK/FDR Memorials, (along West Basin Drive). Another is out the back of the Jefferson Memorial. Both have room to safely load and unload, are within about 100 feet or so of the cherry blossoms, and have ramps to the water’s edge without any need to deal with steps. Other places to See Cherry Blossoms in Washington D.C.
Small clusters of trees can be found along the National Mall, just northwest of the Lincoln Memorial and around the Washington Monument. Riding a bike is another option to get there, although I would not recommended that you ride around the Tidal Basin pathway itself. It gets very crowded with pedestrian traffic, there are no railings along the water around much of it, and there are low-hanging branches to watch out for. There are now some bike racks available near the Tidal Basin. There’s one across from the Capital Bikeshare rack near the FDR Memorial, at the corner of Ohio Drive SW and West Basin Drive SW.
We ended our day by walking to the White House. Although we didn’t see any cherry trees near the White House, there is a giant blooming Magnolia tree that is beautiful. Hope you enjoyed our Cherry Blossom Tour of Washington D.C.
We were in dc recently. Just gorgeous!! Thanks for the spring tour…..especially as it is freezing rain again here! Cherry blossom trees are so pretty! They are sooo pretty and thousands of them is a sight to see!!! Thanks for visiting! Amazing! We have always wanted to be in Washington for the Cherry Blossoms. Maybe next year. Thank you for sharing these beautiful pics. Thank you for visiting and hope you get a chance to see these beauties one day…definitely worth the trip! Beautiful photos of a beautiful place. DC is magnificent many times of the year but especially in Springtime.